The SONEX JP GOLD points the way to the future of rubber with built-in speed-glue effect that incorporates speed and spin plus good control. 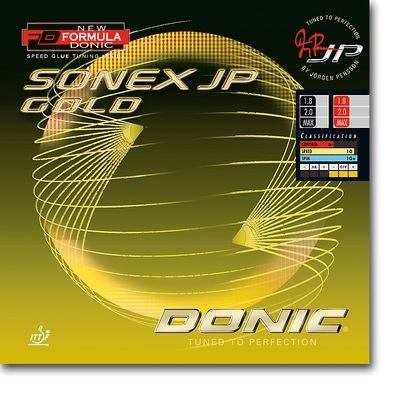 We recommend Jorgen Persson DONIC SONEX JP GOLD for ambitious attackers who want a well-balanced rubber that has the effect of speed glue. This new generation of rubber offers a combination of excellent attacking characteristics with a built-in speed-glue effect. pimple In, Control 6 - Speed 10 Spin 10 -, hardness Medium -, surface Spin Elastic.